As readers of HotWhopper know by now, Anthony Watts peddles disinformation. He's scatty about it. He'll put up contradictory articles without batting an eyelid. There is no rhyme or reason to the various bits of pseudo-science he promotes. It ranges from "OMG it's insects" to "a massive ice age cometh" by 2020. One has to wonder though, since CO2 residence time has been said to be anywhere from five year to hundreds, or even thousands of years, with no solid agreement yet, how they can be so sure of themselves? He's wrong (again), of course. There is a reasonable understanding of how long CO2 stays in the air at least in human time frames. It might not be all that precise because it can't be all that easy to predict how the plants and oceans will respond, given the rapidity of the changes we're subjecting them to. There's no precedent. Anthony is too lazy to read the science or else he's deliberately peddling lies. Or maybe it's just another example of how he doesn't have a clue. On par with his confusion over temperature anomalies and baselines. He's wrong on his numbers, most definitely. 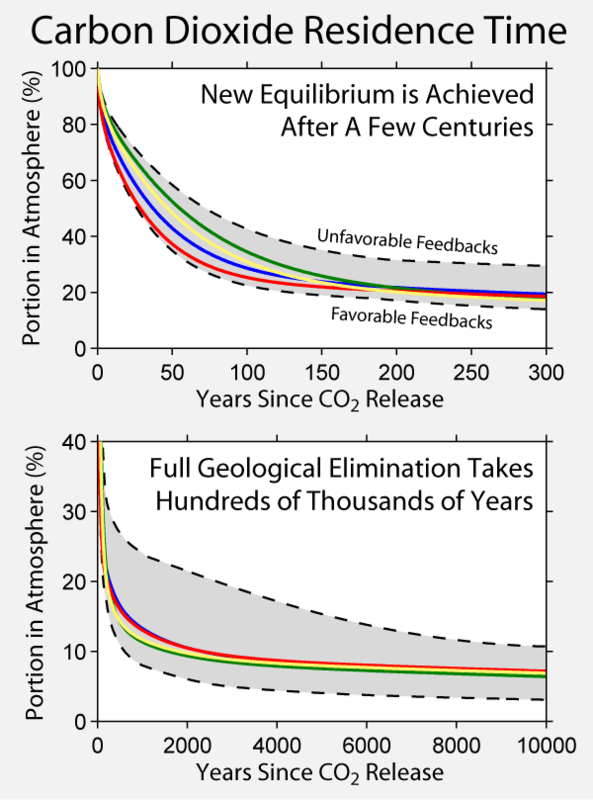 There is no suggestion that CO2 only stays in the atmosphere for five years. And his "thousands of years" could be "hundreds of thousands of years". According to David Archer's 2005 research, a lot of CO2 would drop out in the first few decades if we stopped adding any at all. After 300 years it would have flattened out with somewhere between 17% and 33% of what we've added staying in the air for a thousand years. After 100,000 years there would still be about 7% of the added CO2 in the air. Have a gander at this silly chart that Anthony put up. Click to enlarge it as always. Source: WUWT of course. Where else would you find such a dumb chart! ... The present discussion principally emphasizes that the world’s oceans cannot be expected to remove a major fraction of the industrial CO2 from the air for a long time in comparison with the lifetime of human institutions. Although other mechanisms of CO2 withdrawal may exist, it is probably prudent to expect the concentration of atmospheric CO2 to persist above twice the preindustrial level for at least several centuries. While more than half of the CO2 emitted is currently removed from the atmosphere within a century, some fraction (about 20%) of emitted CO2 remains in the atmosphere for many millennia. By my calculations by our actions we've added more than 900 billion tonnes of carbon dioxide to the air in only 150 years or so. What Anthony Watts is claiming is that "someone said" that if we stopped adding CO2 to the air tomorrow, all that we've added could all be absorbed by the land and oceans in five years. All 900 billion tonnes of it. That represents about 255 billion tonnes of carbon. All being absorbed by plants and oceans in five years. Think about that. The total mass of biomass, minus bacteria, is estimated at 560 billion tonnes. So far, plants have taken up about 25% of all the extra carbon we've dug up and thrown away. That's about 141 billion tonnes. Another 30% or around 170 billion tonnes has been absorbed by the oceans. It's unimaginable that plants could absorb, say, another 116 billion tonnes in only five years. Biology wouldn't allow it. Just as it's unimaginable that the waters of the world could absorb 140 billion tonnes of carbon in only five years. Physics wouldn't allow it. The net flux into the ocean in 2000 was estimated at around 2 billion tonnes of carbon a year. For the oceans to absorb 140 billion tonnes in five years, that would be 28 billion tonnes a year or a fourteen fold increase. If we stopped adding CO2 to the air, each year the partial pressure of CO2 in the air would drop as CO2 was absorbed. So each year a bit less would be absorbed by the ocean. But even if the oceans could absorb at the same rate as in 2000, it would take 70 years to absorb 140 billion tonnes of carbon. Leaving my basic calculations alone, scientists have done the sums and estimated how long it would take for carbon to be absorbed. As I said above, according to David Archer (2005), after about 300 years much of the added CO2 would have dropped out of the air but "17– 33% of the fossil fuel carbon will still reside in the atmosphere 1 kyr from now, decreasing to 10– 15% at 10 kyr, and 7% at 100 kyr". Below is a graphic prepared by Robert Rohde of Global Warming Art. There's fat chance of us stopping all CO2 emissions in the immediate future but a chance we can seriously cut them over the next two or three decades if we put our minds to it. The sooner we start in earnest the better. As the world continues to warm, consequent events such as Boreal forest fires and mid-latitude droughts will release increasing amounts of carbon into the atmosphere - pushing temperatures ever higher. Initially, higher atmospheric CO2 will encourage plant growth as more CO2 stimulates photosynthesis, say researchers. But the impact of a warmer world through drought will start to negate this natural balance until it reaches a saturation point. The modelling shows that global warming of 4 degree will result in Earth’s vegetation becoming “dominated” by negative impacts - such as ‘moisture stress’, when plant cells have too little water - on a global scale. Carbon-filled vegetation ‘sinks’ will likely become saturated at this point, they say, flat-lining further absorption of atmospheric CO2. Without such major natural CO2 drains, atmospheric carbon will start to increase more rapidly - driving further climate change. Vegetation carbon residence time not only is important because of its contribution to GVM [global vegetation model] uncertainty, but also represents a key stage in the cascade of carbon from the atmosphere, through various organic and inorganic surface pools, and back to the atmosphere. Changes in vegetation carbon residence times can cause major shifts in the distribution of carbon between pools, overall fluxes, and the time constants of terrestrial carbon transitions, with consequences for the land carbon balance and the associated state of ecosystems. My area experiences a 100-degree annual temperature swing. The notion 4 degrees would have any noticeable effect on vegetation is laughable. I’m with talldave2, being in Denver, we’ve experience lows last week of minus 10 and an expected high today of 60. With a swing of 70 degrees in about 7 days, it is hard to imagine we’d notice a thing with a 4 degree difference. German and Austrian taxpayers who are funding this sort of alarmist nonsense from the Potsdam Institute for Climate Impact Research in Germany and the International Institute for Applied Systems Analysis in Austria should feel savagely aggrieved. 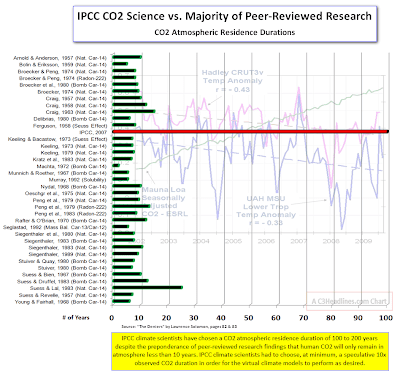 One glance at the chart of peer reviewed literature would tell one that CO2 remains in the atmosphere for less than 10 years, not 100 years. The IPCC might as well claim 1,000 years and make a real meal of it all. Actually, nicholas, the IPCC "says" 20% of our CO2 pollution stays in the air for many thousands of years. A warmer world will create drought??? I stopped reading at that point. Umm, the warmer world means that there is more drought and fires and plants will die and burn and give up CO2 making it warmer still. Rob Potter is another one who commits the logical fallacy of personal incredulity and thinks that "scientists don't know nuffin'". He says that he doesn't like the definition of residence time of carbon in vegetation. He's not interested in that. In fact he doesn't even believe that droughts will get worse as the world heats up. He thinks that all the moisture in the air will stop droughts from happening. Silly Rob doesn't know that we will have more droughts and more floods, sometimes in the same place at the same time. I suppose he thinks he knows all this because he thinks that scientists (who don't know nuffin') told him so. Wait a minute, all the discussion of residence time has referred to CO2 in the atmosphere, not plants. In the very first sentence they have re-defined this as “the length of time carbon remains in vegetation during the global carbon cycle – known as ‘residence time’ -”. This is a bait and switch as non-one is concerned with residence time in plants, only in the atmosphere. And even more junk when they use 4 degrees as the end of the world scenario, but the effect on plants is the supposed widespread drought that this 4 degree rise creates. Really? Such a rise in temperature is going to remove water vapour from the atmosphere? Despite the fact that such an increase would release a great deal of frozen water from glaciers and get it into liquid form where it will evaporate easier? The simplistic idea that warmer equals drier is the complete opposite of the basic CAGW meme that CO2 effect in the atmosphere is amplified by the increased water vapour which it causes. No, pile of junk from the first to the last. No basis in physical or biological fact (as the people who have pointed out how well plants grow at a wide range of temperatures have already pointed out). RockyRoad says the Earth system has no limits. All the world is infinite. There’s somehow a limit to how many trees grow, or how much grass the earth supports, or how many newspapers end up in landfills, or…. These guys are lying like a lot of other politicians I’m familiar with. It isn’t going to warm anywhere near 4° which makes the entire paper a big s0-what. We will likely experience two cool PDOs this century and a solar minimum of some unknown degree. Chances are it won’t be any warmer in 2100 then it is right now, and it could be cooler. 4 degrees is meaningless in agriculture. Each country has its own indiginous plants that are well able to withstand this increase. It is when you plant non indiginous plants that there could be a problem. If co2 drops to 200 to 300 ppm then human beings quit breathing . I wonder if the fact that there are two different residence times you can talk about for CO2 is what is confusing Anthony. One is the residence time of a specific CO2 molecule in the atmosphere which given the yearly cycling of of carbon through the carbon cycle probably is on the order of 5 or 10 years. 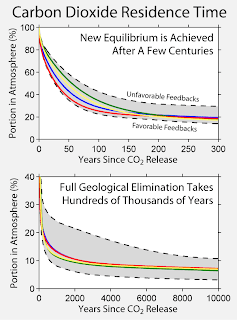 The second is the lifetime of excess carbon in the active carbon cycle which depends on geological processes to be removed more or less permanently. That is on the order of thousands of years. Failure to distinguish between the two would definitely cause confusion. Anthony has no excuse for confusing the two. He's had lots of articles about it over time. Just a short while ago there was much discussion about a silly article by Christopher Monckton. Though I can't blame anyone for not making head or tail of what Christopher Monckton writes. Anthony's been blogging about weather and climate for nearly seven years. That's more than enough time for him to have picked up the basics. Heck, there have even been two major IPCC reports since 2007. His only excuse is lack of wit. The reason is different. He peddles pseudo-science, anti-science and disinformation. Facts don't go down too well at WUWT. Deniers abhor scientific facts. I had a long argument a few years back with a few skeptics on a certain forum who had pushed that chart. The concept of residence time of a pulse of CO2 vs average lifetime of a CO2 molecule was beyond them. A lot of it was due to them forming barriers up front. 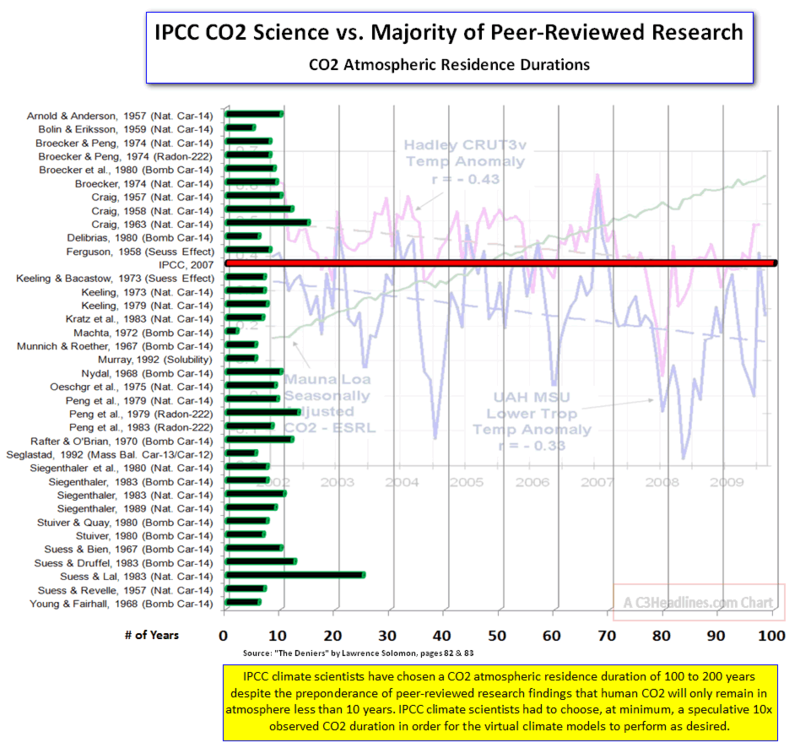 They had merely understood the caption of the chart which claims the IPCC is wrong and the imagery of it, and from that had internalized a great deal of assumptions. It greatly excited them in it's simplicity. When I told them that it's actually more complicated and therefore the chart is wrong they resisted. What's in it for them to learn? To learn they not only have to accept they don't actually understand the concept of residence time, they also have to *think* and even worse the end result could lead to them having to give up their exciting chart argument. So what's the upside to learning? Far better to not bother having to think and therefore never actually know the chart is wrong. And if to their knowledge the chart isn't wrong, therefore they can feel happy to keep promoting it. So the chart has been around for a while. It figures, with the newest date being 2007 and many of the references being from the late 1950s to the early 1970s - some from before Keeling started to regularly measure atmospheric CO2. Whoever drew it up probably figured it would be harder to check old references. And that no fake sceptic worth their salt checks references anyway. And that fake sceptics would never do any research of their own and look for recent papers on the topic. How quaint, they are using Fahrenheit and thinking that 4°C is not very much. When average temps were about 5 degrees C warmer than now, there were no ice caps. Approximately five degrees cooler is an ice age. Those two commenters who think plants won't notice a thing with "only" 4 degree temp difference are monumentally ignorant. I don't know how you deal with such stupidity on a daily basis, Sou. I'd have had an aneurysm by now. Just about every time Watts opens his mouth he is "showing his shortcomings"
This persistent notion that confabulates and organism's tolerance of diurnal temperature fluctuations with adaptations to long-term temperature means is one of the surest signs of ignorance of eco-physiology. Without going too far into it now (it's the subject for essays and indeed for books) there are two points that deserve to be raised. These points can be usefully illustrated by example. First, many of the pome and stone fruit varieties that used to be favoured by our local orchardists require sufficient chilling hours to set fruit - these days there's simply not enough chill to set fruit well for these varieties. Oh, they can tolerate sub-zero temperatures right through to 40°C+ scorchers, but without sufficient they can't set fruit - see the problem...? The other issue is that of the frequency of extremes. Another example is our local salmon industry - the fish are able to tolerate a change in water temperature of around 10°C.. Under the current climate regime the chance of water temperature just under the maximum tolerable is quite high, but the chance of exceeding it is very low. Within years to a decade or two the chance of exceeding during any year the maximum (around 20°C) will be far greater, even though the shift in mean is only a degree or two, and as a consequence the ability to raise a generation of fish to maturity drops precipitously. See the problem? Bottom line - tolerable temperature range is different to tolerable mean temperature. Only an ignorant or a mental incompetent conflates the two. Agree, Bernard. We get far fewer frosts than we used to get. And it's not just temperature that's causing problems. Unseasonal humidity does too. That is, what would have been unseasonal before climate change kicked in. Summer is meant to be dry in our part of the world but with the climate shifting poleward, we're more often picking up bits from the northern "wet" which is causing fungal outbreaks and other problems right before harvesting, particularly affecting stone fruit and probably grapes. Cereals can suffer a lot too with changing rainfall and humidity. Pastures can be badly affected by drought and heat, curling up and dying. I know there is research going on for different localities to plant more deep-rooted pastures to better survive heat waves and drought. In case there was any confusion, I meant to say "...but without sufficient chill they can't set fruit", but I FUBARed the italics tagging and just disappeared the whole word. Honestly, if you can't distinguish between four degrees Celsius and Fahrenheit, then you can't possibly have an informed opinion on climate change. Yamamura, K., and K. Kiritani. 1998 A simple method to estimate the potential increase in the number of generations under global warming in temperate zones. "The Intergovernmental Panel on Climate Change (IPCC) estimated that the global mean surface air temperature will increase about 2 degrees C above the 1990 level by 2100. Such an increase in temperature may result in an increase in the number of generations per year of most insects. " And as others have expressed above, not being able to tell the difference between degrees F and C, and the resulting implications... and even *worse*, diurnal vs. mean temps... wilfully ignorant they are. This brouhaha over the persistence of CO2 in the atmosphere reminds me of the stink over Solomon et al 2009 (www.pnas.org cgi doi 10.1073 pnas.0812721106). The denialati didn't like it then, and even now they still haven't forgiven Solomon et al. On the matter of plant growth, CO2 and 4°C of warming, in the Australian context it's important to note that the continent's soils are nitrogen and phosphorus deficient and the growth "benefits" of increased CO2 are much reduced or absent. And of course evapo-transpiration increases with temperature (as does night-time respiration which is temperature dependent, and which emits CO2) so water is also a Sprengel limitation. It doesn't take an Eruca sativa scientist to figure out the implications of this. And also on the subject of 4°C of warming in Australia, I'll put in a plug for Four Degrees of Global Warming: Australia in a Hot World, edited by Peter Christoff. It is a good collation of the understanding of what our current trajectory will do to the country, ecologically and economically. I have a few gripes with it - the black-and-white figures are very sub-standard (to the point of incomprehensibility in some cases), there are many axis terms/acronyms that are not explained, some chapters tend toward assumed technical knowledge that would discourage lay readers, and it needs a second editor more distant from the intricacies of the science - but overall it's a big slap in the face for those currently basking in complacency. There are typically 40 million bacterial cells in a gram of soil and a million bacterial cells in a millilitre of fresh water. There are approximately 5×1030 bacteria on Earth, forming a biomass which exceeds that of all plants and animals. Small problem there with your thesis there, Panickists. In stricter scientific applications, biomass is measured as the mass of organically bound carbon (C) that is present. Apart from bacteria, the total live biomass on earth is about 560 billion tonnes C, and the total annual primary production of biomass is just over 100 billion tonnes C/yr. However, the total live biomass of bacteria may exceed that of plants and animals. I don't understand your point, Dave. Perhaps you misunderstood what I wrote.